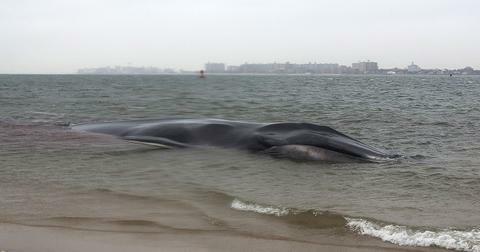 Like many other marine creatures before him, another beached whale has passed away. Cause of death? Plastic. As reported by The New York Times, a 1,100-pound, 15-foot long juvenile male Cuvier's beaked whale washed up in the Philippines over the weekend. The whale died a few hours after being discovered, and when researchers performed a necropsy, they found a whopping 88 pounds of plastic in his body. Early in the morning on Saturday, March 16, the natural history museum D' Bone Collector Museum located in Davao City in the Philippines received a notification that a whale was stuck along the shores of Sitio Asinan, Barangay Cadunan, Mabini Campostela Valley. Just five hours later, he passed away. A team from the museum rescued the body and brought the whale back to Davao. "Doing this is not just for our gain but mainly to give education and for people to realize how magnificent these animals are," read a post on the D' Bone Collector Museum Facebook page. Upon performing a necropsy on the whale, researchers discovered 40 kilograms, aka 88 pounds of plastic bags, in his stomach. Plastic items included 16 rice sacks, four banana plantation bags, various plastic shopping bags, and other plastic items that the D' Bone Collector Museum plans to itemize and share with followers in the coming days. "This whale had the most plastic we have ever seen in a whale. It's disgusting," the museum wrote on Facebook, adding that the necropsy team determined the plastic to be the whale's cause of death. "Action must be taken by the government against those who continue to treat the waterways and ocean as dumpsters." The New York Times spoke with the D’Bone Collector Museum's owner Darrell Blatchley, who attended the whale's necropsy. “The plastic in some areas was so compact it was almost becoming calcified, almost like a solid brick,” Blatchley told the newspaper. “It had been there for so long it had started to compact,” he said, adding that it was the worst plastic pollution he'd ever seen in an animal's body. This story is an important reminder that our actions — especially the overconsumption of single-use plastic — do have an effect on animals, ecosystems, and the planet. If you're interested in reducing your plastic use, check out Green Matters' advice on doing so in the bathroom, the kitchen, during holidays, and while traveling. Humans truly have the power to stop more plastic from entering oceans, and using a little less plastic can go a long way.